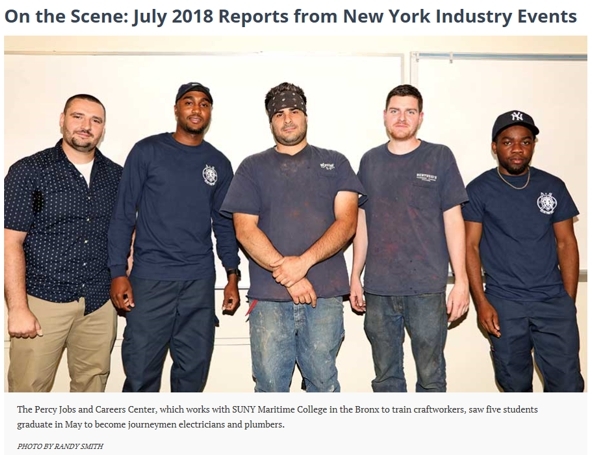 The Percy Jobs and Careers Center, which works with SUNY Maritime College in the Bronx to train craftworkers, saw five students graduate in May to become journeymen electricians and plumbers. Each Percy program, which comprises daily on-the-job training and a few night classes per week, takes three to five years to complete. Graduates are electricians Zwade Amsterdam and Keyonn D. Jemmott, who work at A&S Electrical Inc., and Anthony Buono, employed by Yonkers Electrical Contracting Corp., and plumbers and steamfitters Peter Siderias and Ryley Peterson, who work for Pearl River Plumbing, Heating and Electric. “We need skilled tradespeople like electricians, plumbers and ironworkers. I congratulate the graduates for their hard work. … I know they have bright futures,” said New York State Sen. James Sanders Jr.
By percyjcadmin | Published July 18, 2018 | This article was posted in News. Bookmark the permalink. Follow comments with the RSS feed for this post. Post a Comment or leave a trackback: Trackback URL.